15:00 – 15:15 Opening Remarks: Dr. Alex Berg Gebert, Executive Director UDT, University of Concepción. Orlando Rojas, Wood and Paper Science, North Carolina State University. USA. Options for biorefineries using wood feedstock. Douglas Gardner. School of Forest Resources and Advanced Engineered Wood Composites Center, University of Maine. USA. Integrated forest bioproducts research at the University of Maine. Arthur J. Ragauskas, School of Chemistry and Biochemistry, Institute of Paper Science and Technology, Georgia Institute of Technology, GA. USA. Ludwig Leible, Forschungszentrum Karlsruhe, Institute for Technology Assessment and Systems Analysis (ITAS). Germany. Synfuels, electricity or heat from wood residues under european and german framework conditions. Stephan Kabasci, Fraunhofer-Institut für Umwelt-, Sicherheits- und Energietechnik UMSICHT, Germany. Carmen Michels, Fraunhofer-Institut für Umwelt-, Sicherheits- und Energietechnik UMSICHT. Germany. My Ahmed Said Azizi Samir. KTH Fibre and Polymer Technology, Div of Biocomposites. Sweden. Rory Jara, Universidad de Maine. USA. Pre-extraction of wood strands for the production of oriented strand board (OSB). Eduardo A. Feijo. Generals Motors. Brazil. Use of biodiesel and alcohol as a fuel in motorized vehicles. Jens Ludwig, Institute for Industrial Production (IIP), French-German Institute for Environmental Research, University of Karlsruhe, Hertzstr. Germany. Juan Carlos Carrasco, Technological Development Unit, University of Concepción. Chile. Environmental impact associated with the energetic use of biomasa. Andreas Michanickl. University of Applied Sciences, Rosenheim. Germany. Shortage of industrial wood in Germany: An opportunity for the Chilean forestry sector? Claudia Ulloa. EULA-Chile Centre, University of Concepción. Chile. Christian Bidart. Technological Development Unit, University of Concepción. Chile. Evaluation of the energy efficiency of biomass conversion processes. Jorge Luiz Colodette. Federal University of Viçosa, Forestry Engineering Dept. Brazil. Biorefineries: Study of the removal xiland from eucalyptus wood and its effects on the qualities of pulp. Orlando Rojas. Forest Biomaterials Laboratory, College of Natural Resources, North Carolina State University. USA. Jaime Baeza. Renewable Resources Laboratory, Center for Biotechnology, University of Concepción. Chile. 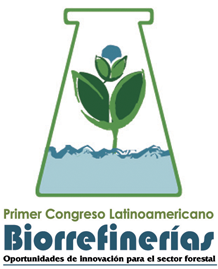 Bioethanol a key element for a biorefinery in Chile. Paola Navarrete. Technological Development Unit, University of Concepción. Chile. Pinus radiata bark as a source of chemicals, materials and energy. Gustavo Cabrera. Catholic University of Temuco. Chile. Characterization and preparation of a new compound based on grape skins and a bio plastic. Cristian Moya. Faculty of Forestry Sciences, University of Concepción. Chile. Lignocellulosic-plastic compounds obtained from pinus radiata D. Don bark or wood and recycled polyethylene through injection moulding. Álvaro Maldonado. Technological Development Unit, University of Concepción. Chile. Development and application of biomaterial compounds. Robinson Betancurt. University of la Frontera. Chile. Theoretical-experimental study regarding the use of metil esters of bassica napus as a fuel. Rodrigo Navia. University of la Frontera. Chile. Production of bio diesel from raps oil (brassica napus) on a laboratory and pilot plant scale. Claudio Muñoz. Center for Biotechnology, University of Concepción. Chile. Production of bioethanol from Pinus radiata and Acacia dealbata bio- organolsolv pulps. Leonardo Olave. Technological Development Unit, University of Concepción. Chile. Reactive extrusion of wood and natural thermo condensable resins.